Why pay more than you have to for quality snow removal equipment? Northshore Truck & Equipment Co., Inc. is a family owned company dedicated to customer service. We have been building Snow Hawg snow pushers since 1991. Our goal is to provide our customers with high-quality equipment at a low, manufacturer direct price. Don't waste time and lose money maintaining your equipment when you could be clearing snow. 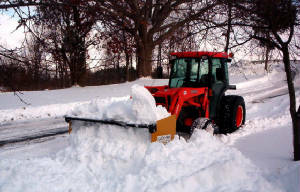 Snow Hawg snow pushers are designed to be simple but extremely productive snow removal tools. In order to to keep maintenance to a minimum we coat our snow pushers with high-quality equipment paint that can be easily touched up at the end of the season. Snow Hawg snow pushers do not incorporate any moving parts that may fail to operate and require repair. 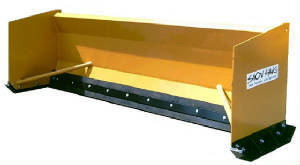 We build our snow pushers in a variety of sizes for skid steers, combination machines, wheel loaders, forklifts, etc. At Northshore Truck & Equipment we understand that your business is unique and will work with you to determine what size Snow Hawg snow pusher will best suit your needs. If you have a machine that requires a custom attachment, give us a call. Because our pushers are manufactured on site, custom work is generally quick and cost effective.